Well, yesterday was Memorial Day. Kick off to summer. However, tick tock, tick tock. Countdown to Fourth of July, when summer’s half over. That is how my mother would have looked at the day. I come by my Glass-Half-Empty mentality honestly. To be fair, she wasn’t negative about all things. But when it came to summertime, she simply thought it went by too quickly. Any more, I think all seasons of the year go by quickly. Time flies even faster as you get older. Enjoy every day. And I have to tell you that we did, indeed, enjoy our Sunday celebration. The springtime weather has been pretty unpredictable so far, at least in my Glass-Half-Empty mind. A lot of rain (which Glass-Half-Full people would say is good for the crops), and temperatures chilly enough that my heat was still going on in the morning. Yesterday I just turned it off, thereby taking away our thermostat’s option of turning on the heat. It’s almost June, for heaven’s sake. If our thermostat doesn’t like it, it can take it up with Google Home. But Sunday’s weather was simply beautiful. The sky was blue all day long with not a raincloud in sight. The temperature was a perfect 70 or so. Jen arrived on our doorstep around 10 and she and I made our quick trip to Fort Logan National Cemetery and were home before noon. A short time later, Kaiya, Mylee, and Cole showed up with big smiles on their faces, and their daddy had an even bigger smile because he got a few hours of time to himself. 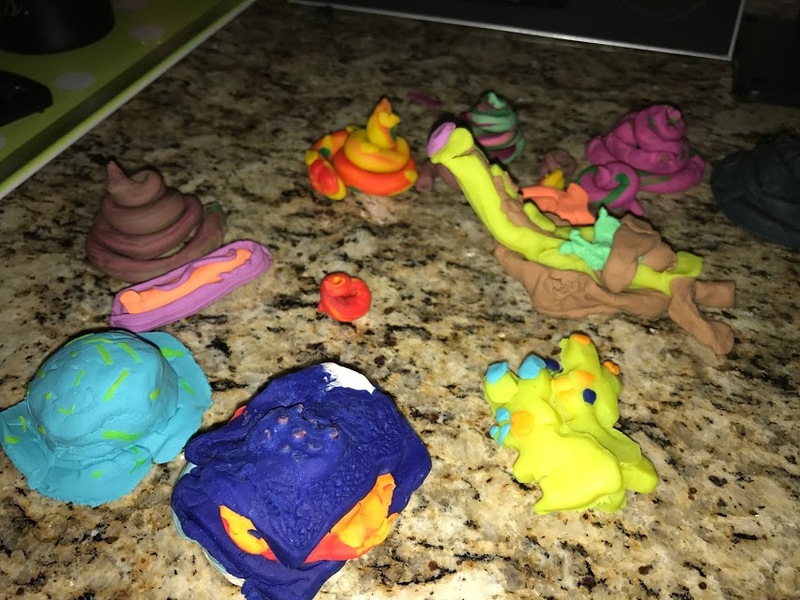 The kids fully intended to spend the day with Play Doh. Because, as you recall, they do love Play Doh….. Instead, I made lunch for them and they ate it outside, and that’s pretty much where they spent the rest of the day – outside. They caught roly poly bugs, they built a village in the sandbox, they spruced up Papa’s horseshoe pit (if you call adding sand to the pit sprucing it up, and by the way, don’t tell Papa). And they ate watermelon. And then ate more watermelon. At one point, Jen said she doesn’t think she’s ever seen a single human eat as much watermelon as each of them ate. Kaiya informed me well into her fourth or fifth slice that the first bite of the point of the watermelon slice is the best, because it’s sweeter than the rest. I’m pretty sure there is no science to back that up, but she would not be dissuaded. 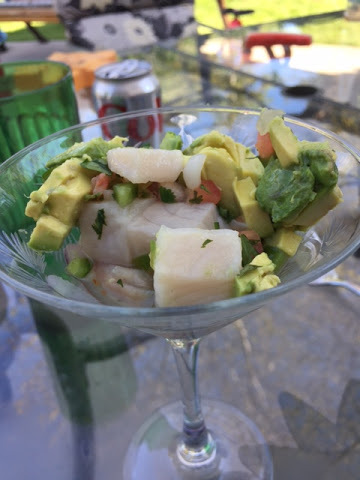 While my ribs were roasting in the oven, I made ceviche. 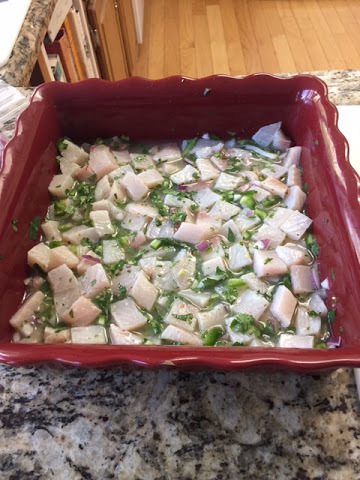 I followed my nephew Erik’s recipe in which I cut up tilapia into cubes, added red onion, cilantro, jalapeno, and salt and pepper. 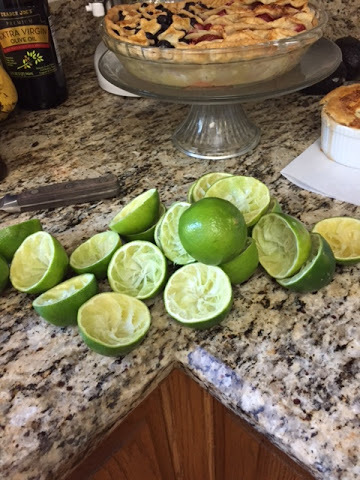 I then squeezed somewhere in the neighborhood of 10 or 15 limes over the whole dish….. When growing up, Mom always made baked beans for any summer gathering. At some point, she gave the assignment to me. 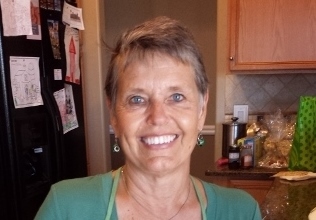 In hindsight, I recognize that she was very smart, because she always told me (probably making sure to whisper so that no one else heard) that I made the best baked beans and that’s why she had me make them. Every single time. Given that her beans recipe consisted of a couple of cans of pork and beans, some ketchup, some mustard, some brown sugar, and some worcestershire sauce, I’m pretty sure a 5-year-old could have made them. Nevertheless, I proudly made the beans then, and I proudly made them Sunday to accompany my ribs. No recipe needed. 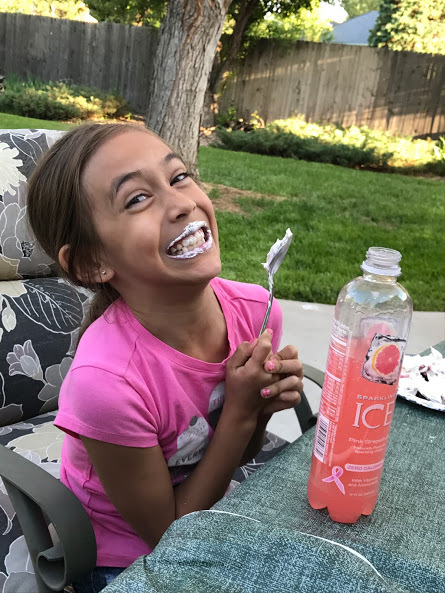 And, by the way, Kaiya likes a little bit of pie with her whipped cream…. 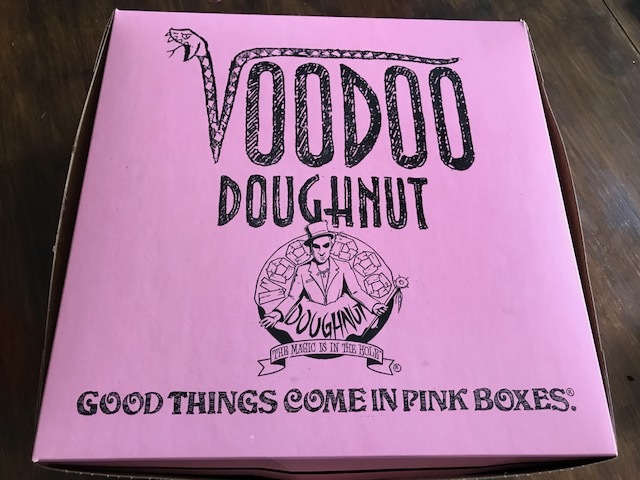 Late in the day, Allen and Emma stopped by to say hi, and to bring a dozen Voodoo Donuts…. 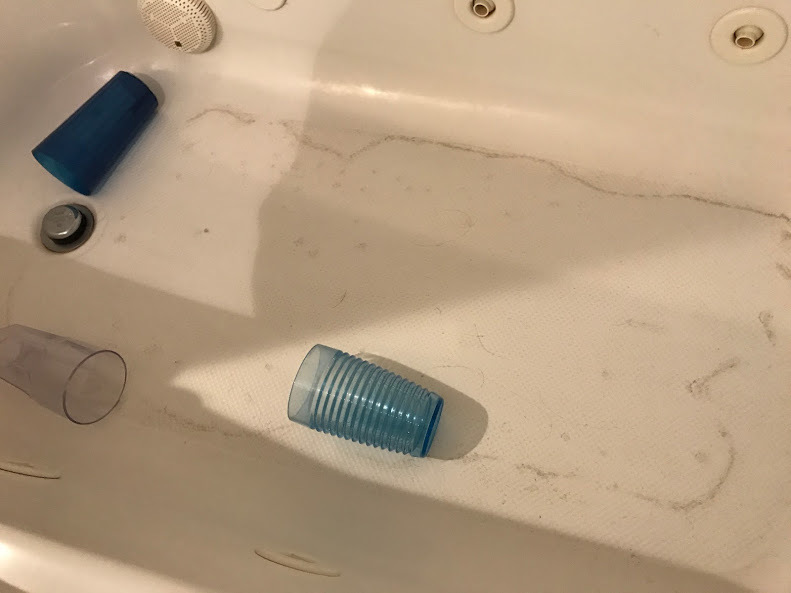 At the end of the day, before the kids headed home, we put them in the bathtub to clean up before they put on their pajamas. As you can see, they were just a bit dirty…..
Just a sign of a really good day. 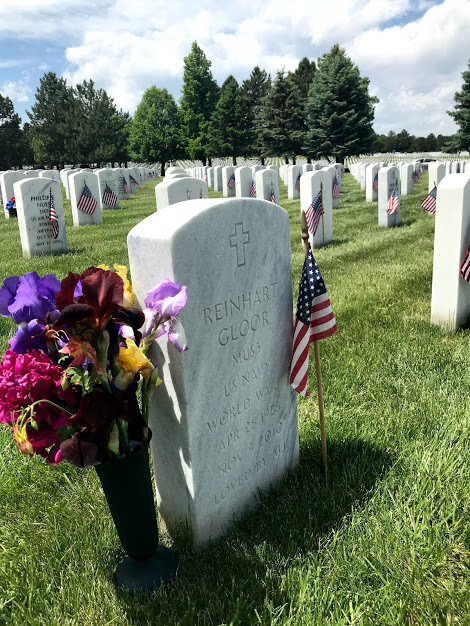 As we do every year when we’re in town for Memorial Day, Bill and I drove out to Fort Logan National Cemetery on Saturday to leave flowers at the gravestone of my mom and dad. I always try to go on Saturday or Sunday as opposed to Memorial Day Monday, because there is some sort of ceremony on Monday that draws throngs. I’m sure the ceremony is lovely, but I simply don’t feel the need to attend. Apparently, in the past, if we’ve gone on Saturday, it’s been later in the day. This past Saturday we went quite early in the morning – not even yet 9 o’clock – because I had a packed schedule both Saturday and Sunday. We were surprised to find that there was a multitude of cars lining the narrow road that runs through the cemetery. Lo, and behold, the Boy Scouts were out putting the flags by the gravestones. And they apparently all brought their friends and relatives, because the area was packed. 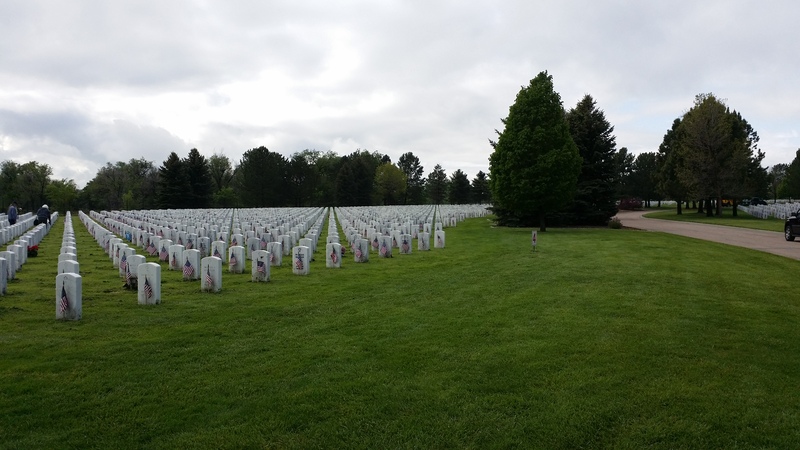 It’s ok, however, because when each gravestone is marked by an American flag, it’s quite lovely and a wonderful tribute to each of those men and women (and their spouses) who served our country in the Armed Forces. It’s actually breathtaking. We were lucky, because the rain that had fallen all night long was finished, and the sun actually came out for a bit. 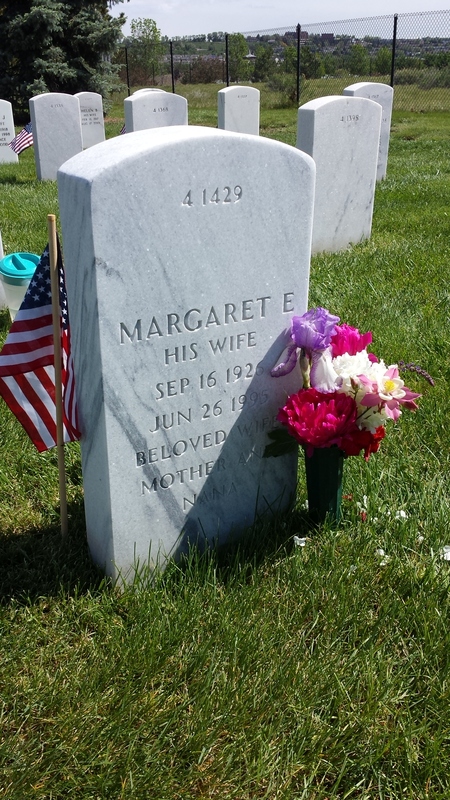 My parents are buried in a national cemetery, so one must be on the ball in order to find the grave as they all look alike. I have a system. I drive until I see a certain stand of evergreen trees. I then search for the grave of a Mr. Henry C. Fisher, a man I never knew but whose grave is at the end of the row in which Mom and Dad’s grave is located. Please God, I hope Mr. Fisher’s family never sees fit to move the grave or I will never find my parents’ stone again. Fort Logan is likely where Bill and I will be buried as Bill is a veteran who served in the Army in the 1960s. While I love the old cemeteries with the big trees and the massive headstones and statuary, I never regret that my parents are at Fort Logan or that we will be there at some point. 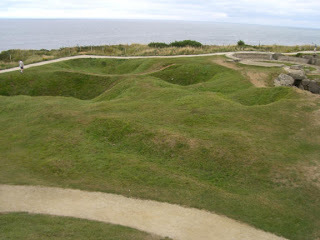 The national cemeteries are so pretty and so well-tended. I do regret that I can’t plant a peony bush like I could at a regular cemetery, but the fact that I never have to wonder if their grave is well-tended makes it worth it. 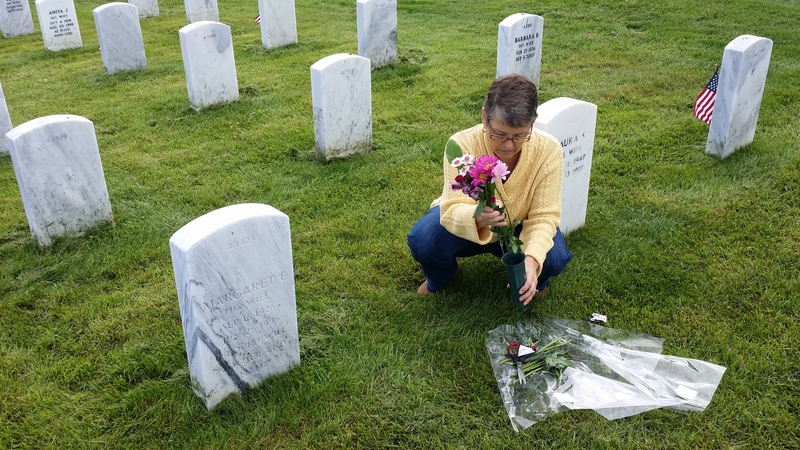 In my blog post last year, I talked about going to the cemetery every year in Columbus with my mom to leave flowers on the graves of her loved ones. It’s really why I go to Fort Logan every year. I know that Mom and Dad are not there, but I know wherever they are, they appreciate that I honor them in this way each year just as they did with their ancestors. I always laugh because many people bring out artificial flowers to leave by the graves, and I totally understand why. I’m well aware that the flowers I leave will likely be dead in just a few days. Nevertheless, I know my mother would haunt me if I left her artificial flowers. 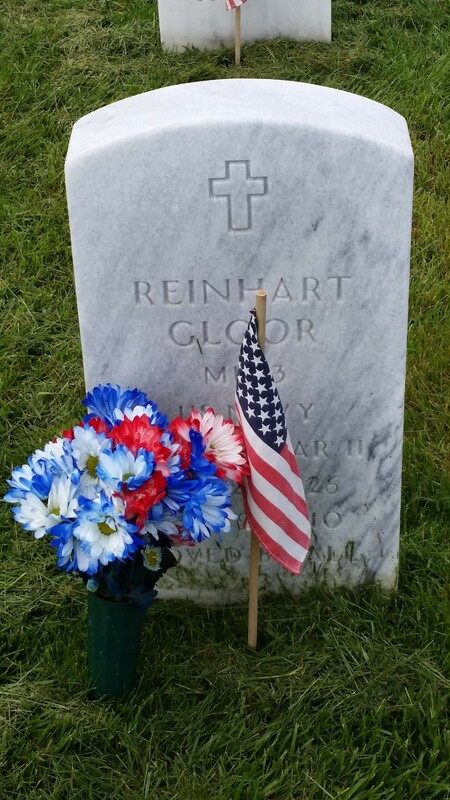 In fact, one year, shortly after she died, Bill made a beautiful wreath using artificial flowers in patriotic colors that we left there, and it weighed heavy on my heart for a long time. Sorry Mom. I hope you all enjoyed (and continue to enjoy) the Memorial Day holiday, which unofficially kicks off summer (and hopefully signals an eventual end to constant rainfall on Colorado’s front range). I’m glad we have such a beautiful and solemn occasion to start off the summer.